Gorillaz are an English virtual band created in 1998 by musician Damon Albarn and artist Jamie Hewlett. 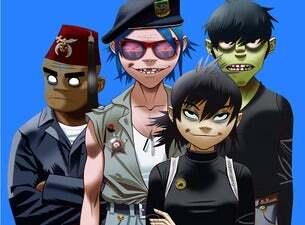 While the band consists of four animated members – 2-D (lead vocals, keyboards), Murdoc Niccals (bass guitar), Noodle (guitar, keyboards) and Russel Hobbs (drums and percussion) – these members are actually fictional and not personas of any "real life" musicians involved in the project. After a short hiatus, the band are heading out on the road this summer, including warm up shows in St. Albans and Portsmouth.